"We were surprised to observe that people who took a typing course, performed at similar average speed and accuracy, as those that taught typing to themselves and only used 6 fingers on average", explains doctoral candidate Anna Feit. This is the first study that explores how people type if they never learned the touch typing system. 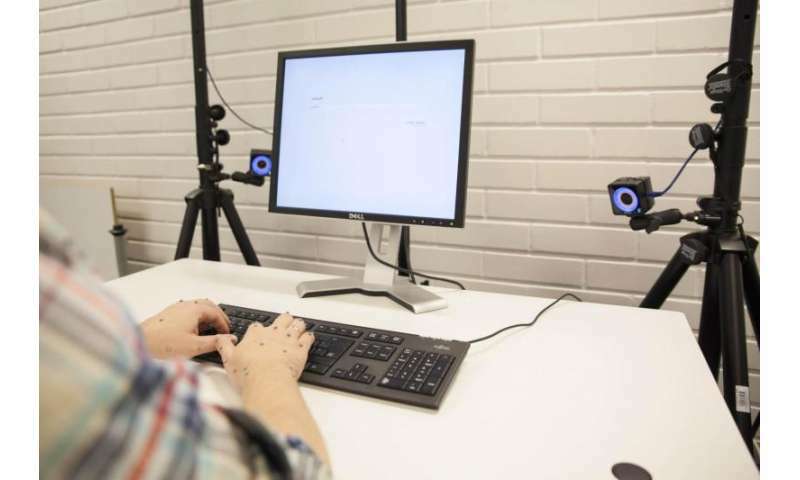 To record the exact finger movements during typing, the researchers used a so called optical motion capture system. Therefore they placed reflective markers on the joints of the fingers and recorded their position with 12 high-speed infrared cameras. Similar high fidelity systems have been used in professional film-making. "When you ask a person which fingers they use for typing, they cannot tell much. The motion tracking data exposes it, and for the first time we can exactly say which finger presses which key", explains Dr. Daryl Weir. Which finger presses which key? 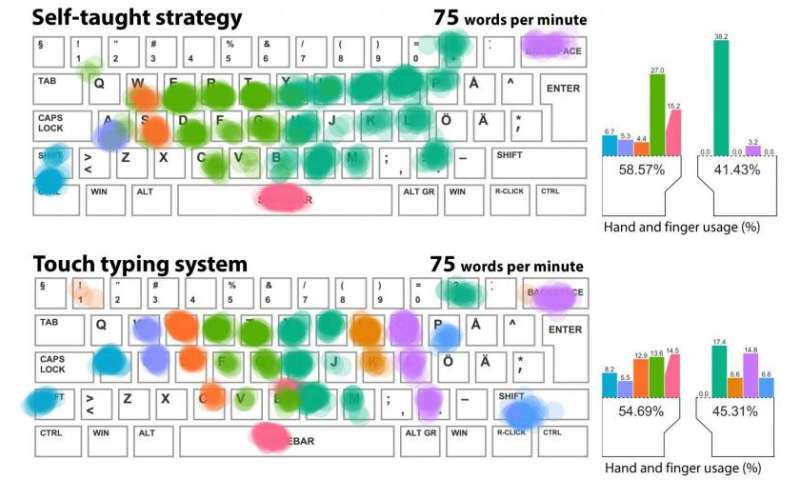 Strategy of a self-taught typist compared to the touch typing system. The motion capture data showed that, instead of the number of fingers, there are other factors that predict typing speed. For example, fast typists have learned to keep their hands fixed on one position, instead of moving them over the keyboard, and more consistently use the same finger to type a certain letter. Interestingly, most participants used their left and right hand very differently. While the left hand was always kept on the same position, the right hand would frequently move from one side to the other, covering a large number of keys. The researchers believe that our typing techniques reflect the tasks we do often with a computer. "The touch typing system was developed for typing sentences on typewriters. It is not advantageous for Photoshop shortcuts or gaming, often done with one hand on the mouse", Feit explains. The study found a large diversity of ways to move hands while typing, by looking for commonalities between the participants in which finger they used to press a key. They found 4 groups of typists that were doing similar movements with the left hand, and 6 groups for the right hand. The strategies ranged from using mainly 1 or 2 fingers of a hand, to using a modified touch typing system. Some typists had unique behaviours, like using Caps Lock instead of the shift key, or using both thumbs together to hit the space bar. Interestingly, for each group they found some participants that were typing very slowly, and others who were very fast, all using the same strategy. However, the researchers emphasize that, if properly learned, the touch typing system can have some benefits over self-taught strategies. For example, they found that untrained typists spent about twice as much time looking at their fingers instead of the screen, which can affect speed in complex editing tasks, often done on computers. Anna Feit is a doctoral researcher in the User Interfaces group of Professor Antti Oulasvirta. Her work focuses especially on how input methods can be optimized for performance and to better support the users' existing skills and expertise. Understanding the cognitive and motor aspects behind basic activies of computer usage, such as typing, is invaluable for the design of new user interfaces, and could lead to new training methods and improved user support. For example, they found that untrained typists spent about twice as much time looking at their fingers instead of the screen, which can affect speed in complex editing tasks, often done on computers. The big advantage is, of course, that you look at the screen rather than at the keyboard. With semitransparent VR this advantage may fall by the wayside. I have no trouble hitting the backspace key without looking at it. Is there no study to determine if the DVORAK keyboard is even more efficient than the QWERTY set-up? Maybe there could even be much more efficient layouts not based on straight rows.